trying to blog and watch netflix at the same time is nearly impossible for me. i'm currently finishing up scandal and rewatching The Office, and I just caught up with Jane the Virgin. and Jane in Jane the Virgin has writer's block! Like me, right now. So, this will be quick, because I want to see how Olivia Pope conquers the country in this world in this show. but There's a line from Jane the Virgin that's stuck with me for this past year now that i need to share- "inhala, exhala", meaning "inhale, exhale." And that's what I need to remember, to breathe in and to breathe out when times are rough. to pray when times are rough. to trust in God when times are rough. because inhala, exhala- things will be ok.
i found these chai-spiced chocolate chip cookie recipe after i went to a hole-in-the-wall restaurant in Hayward that served free chai tea. It was my last week of work, and I wanted to make something different for the office, and I knew a lot of them liked chai tea. the dough came together quickly (less than 15 minutes!). I chilled the dough, scooped and baked them the next morning, and brought them to the office freshly baked. it was slightly gooey, crisp on the outside, soft on the inside. chunks of chocolate throughout, with that extra hint of flavor from all the ground spices in the mix. it's a cup of chai tea in your cookie! baker's notes: i wouldn't skimp on these spices- they add so much flavor to these cookies. 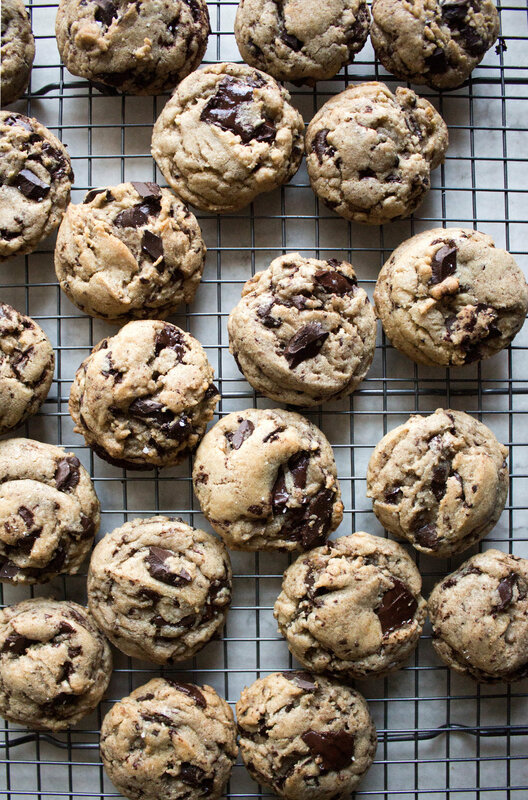 if you're looking for a regular chocolate chip cookie recipe, i'll have a recipe for you soon! or, omit all the spices and call it a day. for the gooey chocolate look- go for chopped up dark chocolate bars. otherwise, packaged chocolate chunks or chips will work just fine. in a medium bowl, whisk together the flour, baking powder, baking soda, ground ginger, cinnamon, cardamom, cloves, allspice, black pepper, and salt. set aside. in a medium-large bowl, beat together the melted butter, brown sugar, and granulated sugar until thoroughly combined. add the eggs, one at a time, until well-combined. stir in the vanilla extract. slowly mix in the flour, stirring until there are no longer any streaks of flour. stir in the chocolate chunks. wrap the bowl in plastic wrap, and chill for at least an hour, or up to two days. preheat the oven to 350 f. prepare two baking sheets with parchment paper or silicon baking mats. using a medium cookie scoop, scoop out balls of dough. your cookie dough might be pretty chilled thus making scooping difficult, so you may need to push some dough into the scoop before pushing the lever. 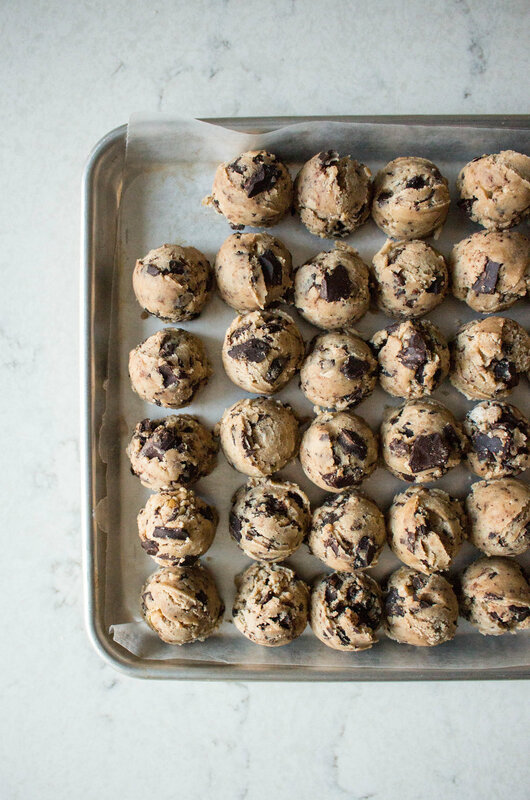 i like scooping out all my cookie dough balls onto a sheet before baking them off. 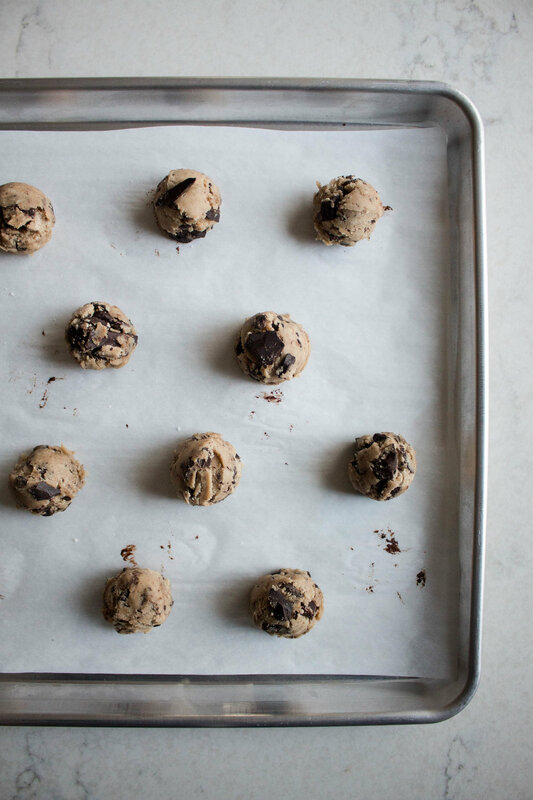 place cookie dough balls onto the prepared baking sheet two inches apart. 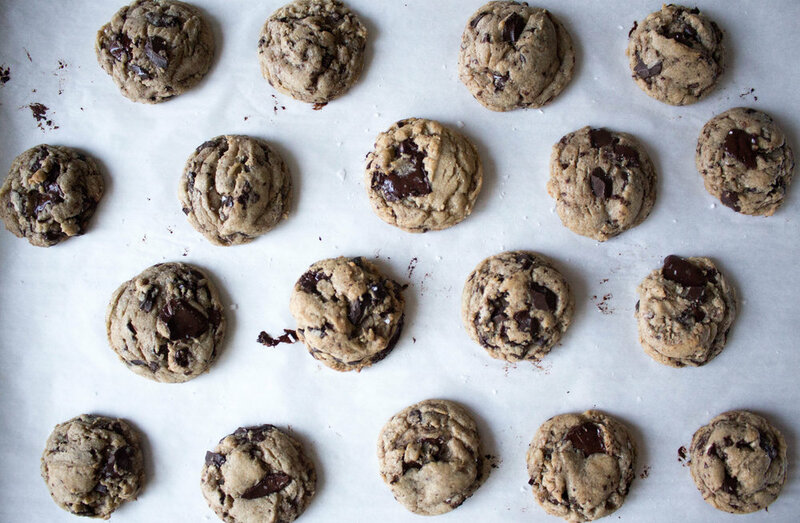 bake the cookies for 8-10 minutes until they are golden brown. sprinkle with salt when you remove them from the oven, if desired.